NEW YORK, NEW YORK - It’s not too often Latino poets are honored by naming museums, cultural centers, schools, and streets after their name. This is not the case for Puerto Rican born Julia de Burgos, whose poetry, continues to inspire poets, feminists, poetry aficionados, and even politicians. To further honor Julia’s powerful literary art, the United States Postal Service will be releasing a stamp in her honor next month, recognizing National Hispanic Month. But, who is Julia de Burgos? Julia was born on February 17, 1914 and grew up to be perhaps the greatest poet from Puerto Rico and is considered one of the greatest poets from Latino American, along side of Gabriela Mistral. As the youngest of 13 children, Julia’s family was very poor, with six of her siblings dying of malnutrition. Through her determination to succeed, she attained a scholarship at age 13 to attend the University of Puerto Rico. Julia left teaching to focus on her marriage and writing, of which some of her work was published in journals and newspapers. While her writing grew, her marriage began to suffer as she spent more time with the activist group. She and Ruben divorced in 1937. That same year, Julia published her first book “Poemas Exactos de Mi Misma.” A year later, she published her second book “Poema en Veinte Surcos.” To promote her books, Julia traveled around the Island, conducting book readings and drawing the attention of critics. Three years later, she moved to New York City. In New York, Julia got by working as a journalist. It was here where she met Dr. Juan Isidro Jimeses Grullon, whom they say she fell madly in love with, although they never married. Dr. Jimses Grullon took Julia to Cuba where she studied at the University of Havana. Their relationship fell sour and two years later, in 1942, Julia returned to New York by herself, without much money. Working as a receptionist then as a secretary, Julia did not write any longer, instead turning to alcohol to relieve her heartache until a year later, in 1943, when she met and married Armando Marin, a musician. It is not clear what caused their marriage to dissolve, but this second divorce in 1947 pushed Julia into a deeper depression and serious alcoholism. Not having been heard from since June 28, 1953, Julia’s family and friends initiated a search and found she had been buried in New York’s potter’s field. In backtracking what happened to her, it was found that on July 26, 1953, Julia had collapsed on a sidewalk in Spanish Harlem and taken to the hospital where she later died of pneumonia. She was only 39. 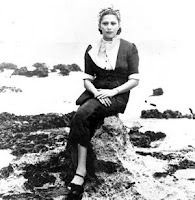 Upon discovering Julia’s tragic death, the people of Puerto Rico created a commission to bring her remains back to the Island in September of 1953, where she was given a hero’s burial. Since then, the city of San Juan, Puerto Rico has named schools and avenues after the famous poet. A shelter for physically abused women bares her name and the Julia de Burgos Museum of Arts and Sciences was also established. In 1987, Julia de Burgos was granted a doctorate in Human Letters and Arts. The U.S. has also honored Julia’s legacy with the Julia de Burgos Latino Center at Yale University, the Julia de Burgos Cultural Arts Center in Harlem, and numerous other centers and schools bare her name. Now, the United States Postal Services will be honoring Julia with a stamp baring her image, which will be unveiled in September 2010, in time for Hispanic Heritage Month. There is no question today that this Latina continues to reach the old, the young, the feminist, and the inspired. Some of her famous works can be found here.